We know you are an ACTIVE woman! So we created a bag for your needs: inside Bookletta MAXI there is enough space for your laptop, for papers and documents, for your photo camera, chargers, gadgets and everything else you need to carry with you day by day. 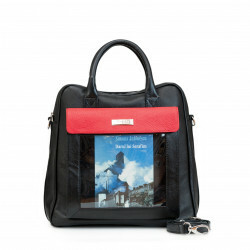 Bookletta MAXI is the office & elegant type of book bag, ideal for your daily activities and office life. 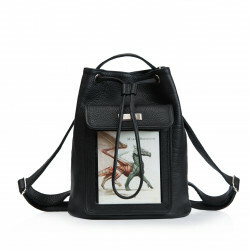 It is made of natural italian leather and the book pocket had a very resistant and transparent plastic foil. Inside there are two small pockets for small items like keys, make-up, your phone and other things.The bag has small hand straps and a long detachable and adjustable strap for your shoulder. * The book is in english and it will be randomly chosen for you.